The Little Marshmallow Cookie Sandwich Spot-Hitter At Hudson Valley Marshmallow Co.
During the lowest temperatures of the polar vortex, and during the darkest nights of evening snow-shoveling in preparation for the morning, visions of blow-torched marshmallow cookie sandwiches have kept the home fires warm until the next time we can experience the real deal - firing up the little delight to hit the sweet spot of a chocolate craving! The marshmallow cubes at Hudson Valley Marshmallow Co. These are made here in Beacon. The prep for the s’more, before it gets torched in the video below. And I don’t even normally like marshmallows (except for these, melted, it seems). Which is why it has taken me until now to finally visit Hudson Valley Marshmallow Company and actually experience one of their toasted marshmallow s’more bite sandwiches between two cookie crackers (your choice of chocolate chip, chocolate chocolate or cinnamon), smushed into your choice of a single square of dark or milk chocolate (made by Alps Chocolate, right down the street! ), and blow-torched to perfection by the marshmallow-ista. (What would you call the barista of a marshmallow bar, anyway? We’ll call her a marshmallowista.) Check out this video of her torching the marshmallow, and the special smush it gets once melted. The s’more cookie crackers at Hudson Valley Marshmallow Co. These are baked right here in Beacon. If you like gingerbread and pumpkin spice, you will face a tough choice between the two. For me, the choice is clear: salted caramel marshmallow between two chocolate chocolate cookie crackers (you can always mix and match), and a square of milk chocolate. Fire it up! There is a growing number of marshmallow roasting gifts in the store. You could of course buy bags of the small-batch marshmallows (see their clever bags of black coal at Christmas), and a personal marshmallow roaster, should you want to start roasting inside your kitchen. Valentine’s Day is just an excuse to buy these things, as eating these little s’mores any day of the year would give the same satisfaction as eating a giant cookie or brownie. The choice is yours. A warning: BJ’s legendary three-layer cakes are right next door. Find this strip of storefront heaven on the west end of town, toward the DMV. Also be warned: Hudson Valley Marshmallow is only open Thursdays to Sundays. But they are open until 8 pm. So all you commuters and neighboring shop owners who close and come home at 6 pm have no excuse for not going! One of the things that make the holidays so wonderful is the FOOD! The special meals that bring us all together. Some families have their big meal on Christmas Eve while others have it on Christmas Day. If there is a day you plan on dining out, our trusty Restaurant Guide is always here at your service. In this case, we saved you some time in finding out who on Main Street will be open and closed Christmas Eve and Christmas Day. BJ’s Soul Food Restaurant, at 231 Main Street, will be open on Christmas Eve, 7:30 am to 9 pm, and Christmas Day, 7:30 am to 6 pm. Isamu Sushi, at 240 Main Street, will be open both days with their regular hours. The Roundhouse, at 2 East Main Street, will be open in the lounge on Christmas Eve and Christmas Day, 3 to 10 pm. The Springfield Baptist Church is serving free Christmas dinners on Christmas Day from noon to 3 pm. They will deliver three or more dinners. For delivery, call (845) 464-2480. The church is located at 8 Mattie Cooper Square in Beacon. Who’s Open Christmas Eve Only? This page right here is one of our most popular pages in Google around Christmas time. Everyone starts Googling who is open on Christmas Eve and Day! If you run a restaurant and it’s in Beacon and not in this lineup, please email us at editorial@alittlebeaconblog.com! We literally called everyone, so you might not have been able to answer the phone when we called. Don’t be shy! Let us know. If you are a business not in Beacon, but want to be included in this list, consider an Article Sponsorship! 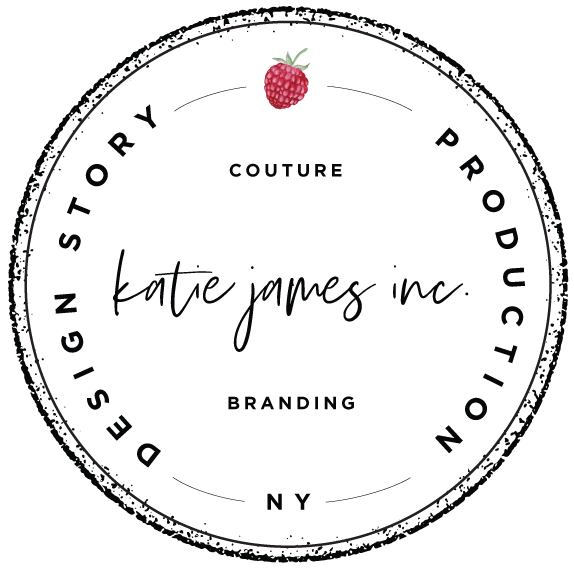 We’ll get your logo and business name listed here. If you are in this list, and you just want to say THANKS, you can also do so with an Article Sponsorship with your logo listed! The For Goodness Bake event is a Beacon staple, and has become an annual event throughout the years. Started by Kristen Pratt and Tara Tornello, the community-sourced bake sale raises money for one particular cause that has demonstrated an urgent need in the community (see below for info on how you can bake). This year, the highly anticipated bake sale is on Saturday, November 10, from 10 am to 3 pm at 145 Main St. in Beacon (aka Beacon Healing Massage and Create Space), near Bank Square Coffeehouse. Bakers from around the Hudson Valley will join the fundraising efforts by donating a variety of sweet and savory baked goods. Pay-what-you-can beverages and coffee will be provided by Drink More Good and Trax Espresso Bar & Coffee Roasters. 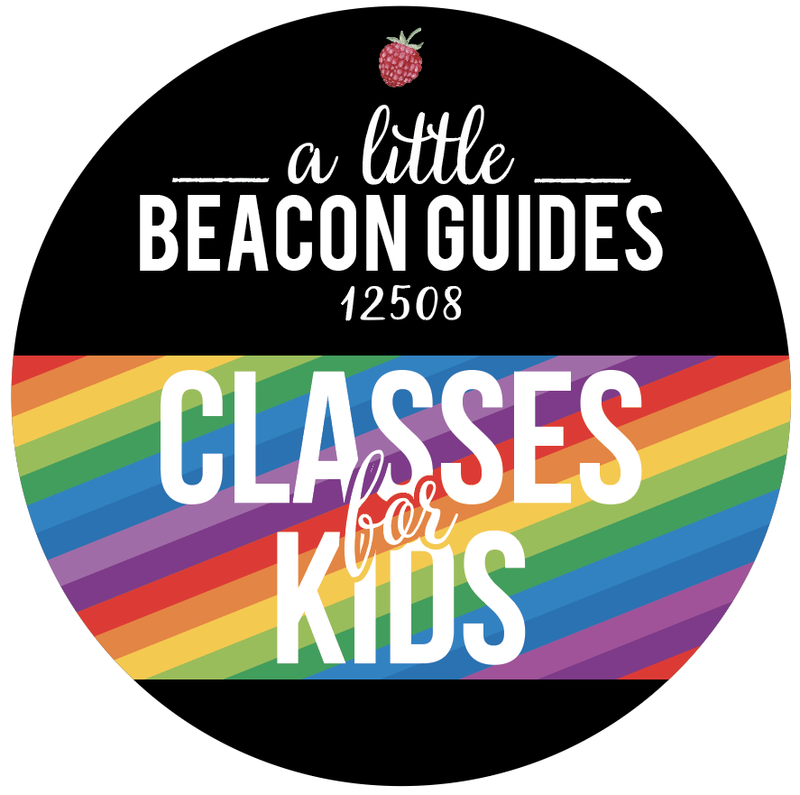 Now in its sixth year, For Goodness Bake has previously raised nearly $15,000 for local causes, including the Beacon After School Program Tuition Assistance Fund, the Beacon Community Kitchen, Green Teen Beacon, and the Kids R Kids Feeding Program. To learn more about the event or to get involved, call (845) 518-4194 or email forgoodnessbakebeacon@gmail.com. INSIDER TIP! They are accepting baked goods up until the last minute. So if you have mad baking skills, use ‘em! I have done it (I am not a baker) and it was a wonderful initiative to be a part of. Simply drop off to to Kristen and Tara tonight (Friday) at 145 Main from 6 to 8 pm, or Saturday from 7 to 8 am. If you are reading this article after the bake sale has ended, but want to offer to bake for another one, email forgoodnessbakebeacon@gmail.com and ask to be added to their notification list. Afternoon snacky snack. A slice of Homespun’s famous carrot cake and a cup of coffee. Alright, fine - the honest answer - this was dinner. Doing a Saturday work session to catch up on publishing some articles that are getting way too backlogged! We’re in the middle of a series on the Shopping Guide Shuffle that highlights businesses who have moved down the street, or moved in for the first time, and the buildings that house them. Then we’re doing a few features on the Real Estate Guide, including a spotlight on Newburgh. The tiny counter at All You Knead Bakery is always filled with curious, good-smelling things that come fresh from the oven in the larger space in the back of the shop. This Sunday morning at 8:30am, fresh crumb cake sat warmly next to these gooey cinnamon buns. Not included in this picture were the salty pretzel bagels. Tempting as this all was, I was on a mission for their chocolate croissant - which I found and devoured in four bites because it is so soft and generously filled with dark chocolate. I couldn’t leave without a blueberry scone, too, just in case anyone around me got hungry a few hours later after our Sunday errands. Turns out, I’m the lucky one who got hungry. All You Knead Bakery is in the middle section of Main Street, just before Rite Aid and past Key Food if you’re walking from the train. It’s across the street a bit from the Howland Public Library. It’s located behind a simple wooden screen door. If you see their sidewalk sign out, you know they are open. On Sundays they are also at the Beacon Farmers Market, just down Main Street. There, you’ll find a similar range of baked goods, but you may also find chicken pot pies, which I’m learning have quite a following. They also sell retail in stores like Adams Fairacre Farms, and you may find them in one of those Taste NY stores off the Taconic. Mission next Sunday? Chicken pot pie. Updates Made to Brunch in Beacon Guide - Chocolate Pancakes Anyone? There's been a lot of movement on Main Street since we first started our Brunch and Breakfast Guide. We've captured the available French Toast options here in this latest update of this Brunch in Beacon, NY Guide. The Guide also includes spots you can find breakfast sandwiches, and cocktails to kick off your day on a festive note. Streets were packed on Beacon's east end of town for the Cupcake Festival 2018. Luxe Optique (where we helped a friend buy some glasses! ), American Gypsy Vintage while waiting for a to-go chicken wrap from Ziatun to eat on the way, NFP Studio (got a personal demonstration of how to wear their architecture-inspired sweaters! ), Utensil Kitchenware (bought some nesting containers at last! ), Jeffrey Terreson Fine Art (always love seeing that guy and he had a stunning, ginormous print on the floor ready for shipping out the door). And at last, we decorated this cupcake from Tops, and indulged in a generous chocolate cupcake with a lot of vanilla frosting from The Chocolate Studio. Alas, we ate it before the camera could capture a picture. We Shopped at American Gypsy Vintage on the way down to the Cupcake Festival, while waiting for a takeout chicken wrap from Ziatun. How many cupcakes should you bring if you're a cupcake vendor? A lot. This is just a fraction - 1/279th - of the cupcakes that were for sale. Finally Stopped into NFP Studio to experience the sweaters! During Last year's Cupcake Festival, no one ventured down to 1 East Main, which is literally Just down a grassy hill from the Happenin' Event. This year, Since Trax Coffee Roasters Has moved in, Cupcake Aficionados Were Happy to venture down the hill. To start, this article announcing the closure of Harry's Hot Sandwiches is titled "Harry's Hot Sandwiches Closes Location in Beacon Theater," as opposed to just saying "closes," and leaving it at that. This article title leaves open the possibility/prediction: This isn't the end of Harry's Hot Sandwiches. 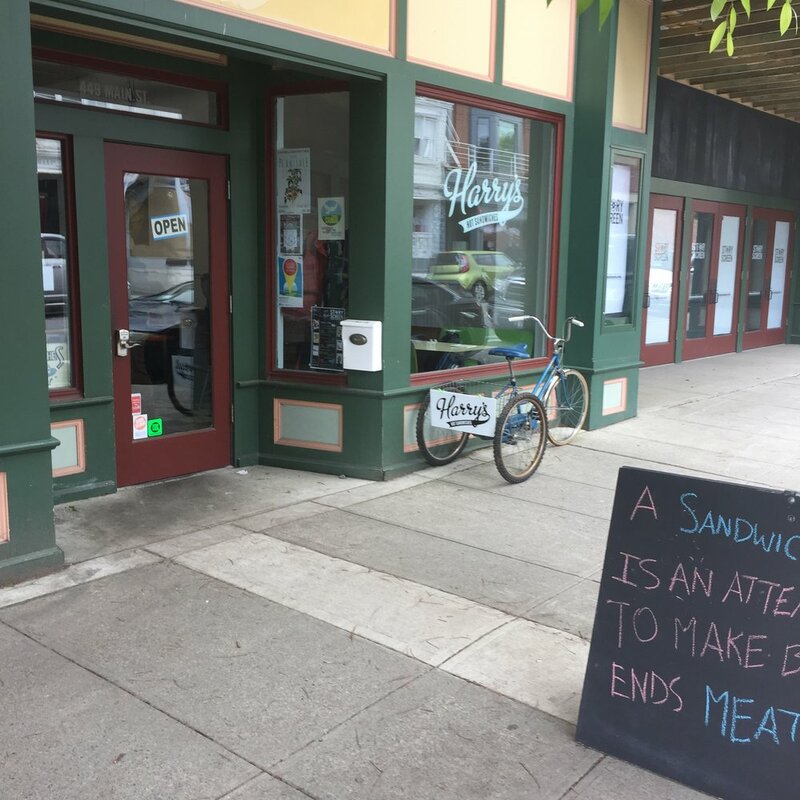 It just may be the end of Harry's Hot Sandwiches in this location. Because here's the thing: Running a small business isn't business as usual. There is no such thing as business as usual for small business owners. There's always a story behind it. 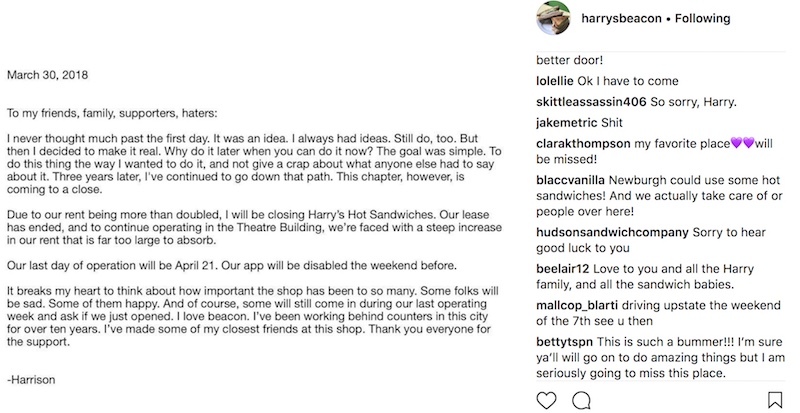 So let's back it up for a moment to explore Harry's Hot Sandwiches, now that he has announced on Instagram that he is closing. He cited a rent increase as the reason for closing, which sparked a social media outrage against landlords and rent in Beacon in general. Harrison Manning opened Harry's Hot Sandwiches after working in many eateries in Beacon. Many knew him from his days working the coffee counter at Bank Square. Then they delighted to see him serving up delicious dishes from The Hop. (The Hop has since closed due to its own inner workings.) One of Harrison's fellow workers from The Hop, John-Anthony Gargiulo, opened Hudson Valley Brewery down behind 1 East Main, and some familiar faces can be seen behind the bar there. When Harrison opened Harry's Hot Sandwiches in The Beacon Theater in 2015, it was during the period when his dad, Patrick Manning, a partner in 4th Wall Theatrical Productions, had taken over the theater in 2011 in order to revive it as a working theater after it had been closed for 50 years. Before Harrison opened his sandwich shop, the space had been home to a coffee shop, and then to an ice cream parlor from the same people who run the Beacon Creamery on the west end of town (across from Bank Square). Both the ice cream parlor and coffee shop were short-lived and closed quickly. The planned theater renovation did not come to be, and by 2015, the property was purchased by a construction company run by the McAlpine family, who had done the construction on that theater after renovating and running The Roundhouse. According to an article by Brian PJ Cronin in the Highlands Current, the McAlpines donated their work to the restoration: "For the next few years, McAlpine Construction donated time, materials and work in order to help restore the theater’s facade and lobby, and build out two commercial spaces on either side of the lobby." Those commercial spaces became Harry's Hot Sandwiches and the alteration shop, By A Thin Thread. Brendan McAlpine became the new owner in 2015, and inherited Harry's Hot Sandwiches as a tenant. Brendan continued the major renovation of the Beacon Theater, announcing the availability of residential apartments and some office space, as well as a movie theater (click here for an inside look at the plans for that movie theater). "Harry's rent has been held so low over the years, that even doubling it keeps it several hundred dollars a month below market. We always worked together on good terms during his lease, and I was disappointed he was leaving. I inherited him as a tenant, but worked with Harry to keep his business moving forward the last couple of years. "Without going into detail, necessary upgrades needed to be made to his space for life safety and health code reasons. While I told him that I would need to start getting closer to market rent and need the upgrades made, I told him we would work toward it over 6 months to a year to allow him to ease into it. With the movie theater opening soon in this building, he should have no shortage of business. We offered to rent him just the kitchen as a vendor for the theater as another possibility, which would make his rent even lower than he currently pays, but he was not interested. I will miss Harry and genuinely wish him well." When Harry's Hot Sandwiches opened, it was an instant hit, and currently has nearly five-star ratings everywhere. The eatery was a media darling, loved by The Valley Table, Visit Vortex, and adored by professional photographers like Meredith Heuer. Our prediction is that we haven't tasted the last sandwich from Harrison Manning. He's too creative to sit still. Maybe you'll see him in a new location in Beacon. Maybe you'll see him in Newburgh. We just don't know yet... Hopefully he will still have the bike delivery option! A reader's question prompted us to call every restaurant on speed-dial to see which spots would be open - if any. Result? It's slim pickins', folks! You had best be cooking in or ordering early from Beacon's amazing specialty stores and picking up by Wednesday. The full list has been updated in A Little Beacon Blog's Restaurant Guide, and the results have been listed here as well. Keep in mind, most everyone is open before and after Thanksgiving Day - so it will still be a bustling week, except for Thursday which will be quiet! 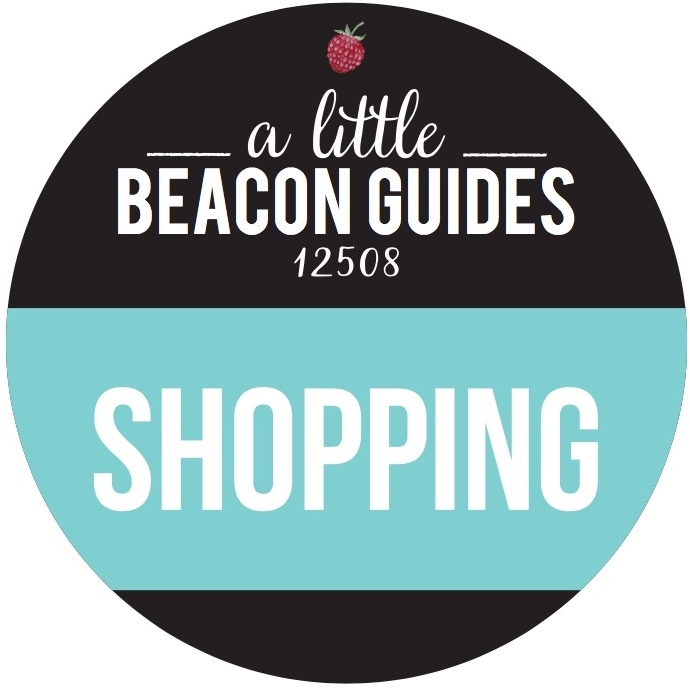 See A Little Beacon Blog's Shopping Guide and Pop-Up Shop Guide for destinations to shop near where you eat! All phone numbers are listed in The Restaurant Guide. Hurry, Special Ordering has begun and most places have fast-approaching deadlines! Cafe Amarcord Set To Open Brick Oven Pizza Restaurant in Beacon - Across the Street! As I was walking down the street one day, I got to chatting with someone about #allthingsbeacon, and they asked me if I knew about the new Italian restaurant going into the former karate school space next to Mr. V's Deli. I had not yet heard about this development, but was intrigued. "Can you believe it?" they asked, "an Italian restaurant right across the street from Amarcord? The nerve." If you didn't know already, know now: Cafe Amarcord is one of Beacon's favorite restaurants, lauded for its fresh, Mediterranean menu. (Check out this review from Hudson Valley Magazine, who really liked the pan-roasted mussels in a white wine garlic sauce, bucatini Amatriciana, pappardelle with black pepper ricotta and dried tomatoes, as well as "a skewer of rosemary-infused lamb served on creamy polenta with a sauce of lemon.") Beaconites are very protective of their local businesses, so they care about what opens where, and whether a new Italian food business would be opening across the street from a longtime business. Amarcord has been open in Beacon for eleven years, so it has quite a following. 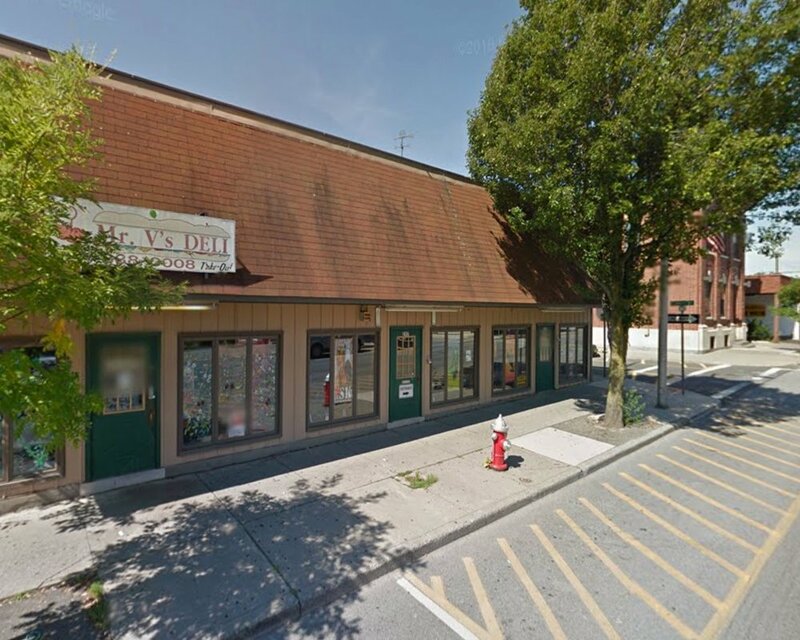 Picture of the building housing Mr. V's Deli before exterior renovations began for Amarcord's future brick oven pizza place. Paper went up on the windows of the short building across the street from Amarcord, and construction began, building out a kitchen and transforming the tired space. When the decorative faux windows and new shingles went up on the roof, Rifo Murtovic, owner of Cafe Amarcord, stepped out of his usual perch in the doorway of his restaurant to stand on the sidewalk of the other side of the street, surveying the construction. Our investigation began immediately, seeking confirmation from Rifo that he himself was the one opening the rumored pizza restaurant. "It will be brick oven pizza," he described. "More casual than Amarcord." The heat source of the oven? Wood. As for making changes to the facade of a building he does not own: "I just want it to look nice," he marveled, while looking at the building seeing in his mind's eye a vision of post-renovation perfection. The owner of Royal Crepes was also outside on the sidewalk during the interview for this article, and enthusiastically interjected more detail: "The pizzas won't be like most Mediterranean around here. They will each be personal pies, and the meat for the toppings will be cut right in front of you. It's part of the experience." Personal, flat pizza pies of the freshest ingredients are the norm in Italy, and they are about to become an option in Beacon as well. Wine and beer will also be available. As of now, there are no plans for delivery. Flavors from Tuscany? Yes, please. Congratulations to Rifo on the new addition. This article is the first in our series covering businesses in Beacon who have opened second or more locations in Beacon. We are currently brainstorming names for this series. Got any? Submit ideas here in the Comments! Photo Credit: Ashley Lederer Chinen, founder of Thoughtful Food Nutrition, based in Beacon. Summer may be over for lemonade stands, but it's just starting for the newest farm-fresh favorite activity to hit Beacon - vegetable stands. Fleeting vegetable markets have popped up in Beacon for a few years now, with the green truck from Green Teen (a program connected to Common Ground Farm) parking in designated lots, as well as appearing at the Beacon Farmers Market (of course) on Sundays. Now, thanks to an initiative from the Beacon Parks and Recreation Department, Hudson Valley Seed (an education-based food-growing program that is woven into Beacon City Schools' curriculum), and Common Ground Farm, kids from Beacon's After School Program (A Little Beacon Blog first wrote about the program here) will be running "Crop Shops," pop-up vegetable stands during the students' Food Fridays, rotating Fridays among South Avenue, J.V. Forrestal, and Sargent elementary schools. In the After School Program, each weekday has a theme, such as baking, karate, yoga, or bird-watching, run by a business or nonprofit from the Beacon community. During the program's first quarterly session, Fridays are designated Food Fridays, and the kids learn to make snacks. Thanks to this program, the kids will also learn commerce as they run the vegetable stands. "Staff from the After School Program as well as Hudson Valley Seed will be on hand to make sure the kids have a great experience and learn about produce, small business and salesmanship," says Nate Smith, the Recreation Department's assistant director. "Please be patient while a second grader figures out your total and makes change!" The kid-run vegetable stands are open to the public, and will rotate among three of the Beacon district's four elementary schools. (Glenham Elementary isn't participating right now.) The stands, which will spend two Fridays at each school, will be open from 4:45 to 6 pm. Half of the stands' proceeds will go toward the After School Program's Tuition Assistance Program, which offers a 50 percent discount to students who qualify for the Free Lunch Program. Kids in roughly half of the families in Beacon qualify for free lunch program. Here's the lineup. Check back with this article to make sure you're going on the right day! The City of Beacon hosted the Cupcake Festival for the first time ever on May 6, 2017, making it possibly the biggest festival in the last few decades to be hosted in this city. So how was it for everyone? We collected feedback from various types of people to look at this from an economics point of view. It's an angle that may fit on the Freakonomics podcast, which studies the hidden side of everything. Skin In The Game - Whose Skin, What Game? When you're young and going to a spring or summertime festival, all you typically think about is who you're going with, when, where you're parking, and how much money you brought to spend on food, tickets, or games. When you're a little kid, you may think about what friends you're going with, but otherwise it's all about the sweets, face painting and bouncy houses. Your only skin in the game is to get sticky with different cupcake flavors. Meanwhile, you're surrounded by businesses whose skin in the game is to create a shop, gallery or eatery that will delight you, and hopefully tempt you into buying something. Not to mention the vendors who secure permits and insurance to attend, then pack up their best selection to unpack and quickly display for you. This article looks at how those two goals work together, for the long run or more-immediate impacts, and how they intersected in Beacon on the day 10,000 people came to town looking to have a great time. Kids decorating their own cupcakes. 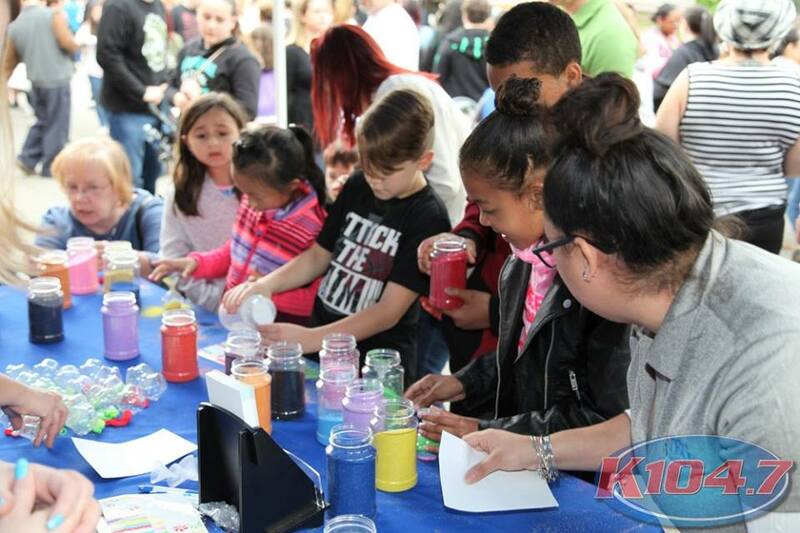 The Cupcake Festival just completed its sixth year of production by radio station K104.7, part of Pamal Broadcasting. 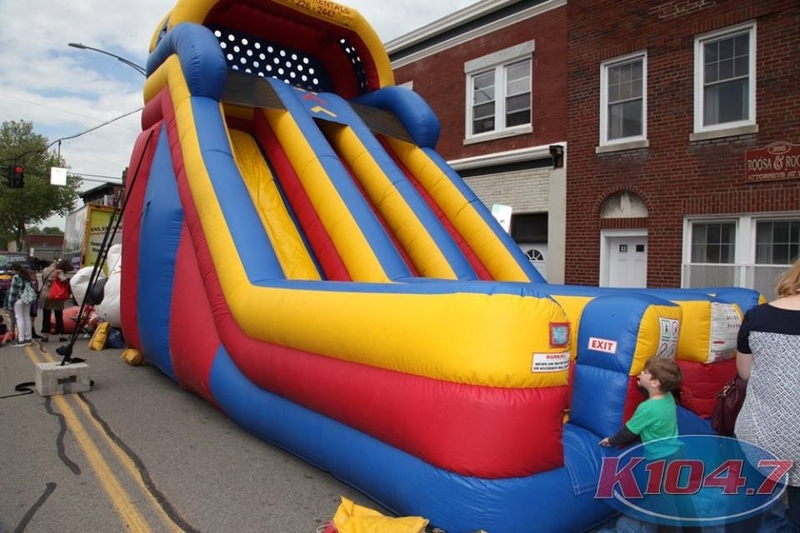 Organizers went looking for a new location after presenting in Fishkill for years, and they wanted to keep a city feel with the party on a Main Street, in the middle of town. 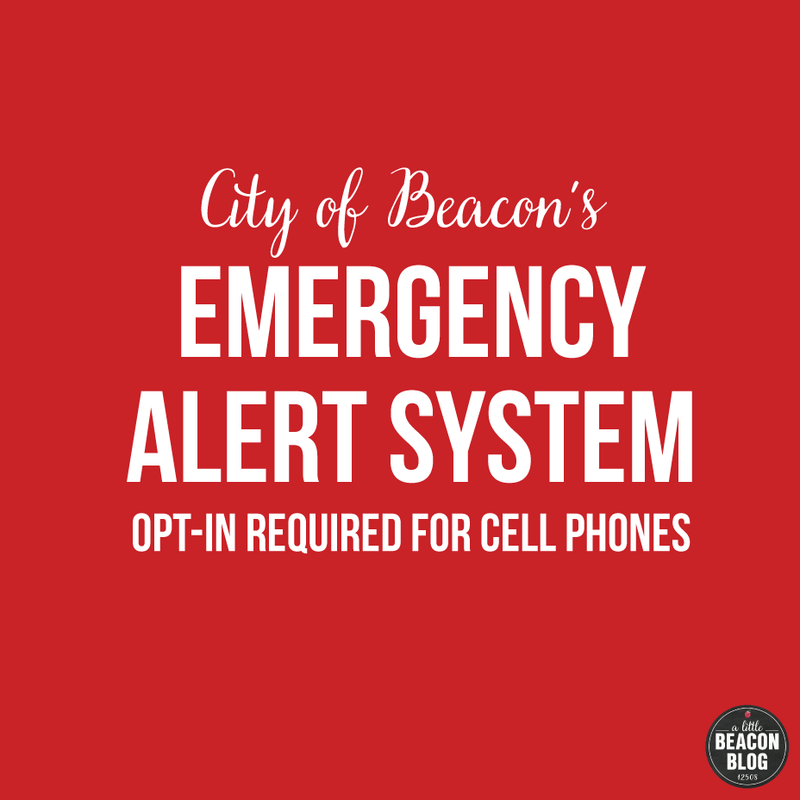 They approached the City of Beacon, and the Mayor said "yes" with the enthusiastic support of the Beacon Chamber of Commerce. Style Storehouse was an official vendor in the thick of it, outside of their shop. All storefronts were permitted to have tables on the sidewalk at no cost to them. Was it a good choice? Says Chamber president Rick Brownell, and owner of Freedom Ford on Route 52: "The Cupcake Festival was a complete success. I took a few walks through the festival and found smiling faces, especially the children. Michele Williams (also on the Chamber board and owner of the boutique Style Storehouse) and I met with festival director Sam Favata of K104.7 a number of times, and he was very receptive to the requests we had. After the event, Mayor Casale told me that he didn't know a lot of people at the festival. That’s a good thing. That's our job at the Chamber - to drive new people to Beacon and let our business community do what they do best." Sam from K104.7 explains the desire for the Main Street location: "As a live and local radio station, we have a strong sense of community and listener experience. We love the intimate setting that our Cupcake Festival has, as it not only showcases the best bakers and bakeries in the Hudson Valley, but the opportunity it creates to bring thousands of festivalgoers to Main Street in Beacon and its businesses. We are thrilled that we were able to showcase Main Street in Beacon and its storefronts as a destination in the Hudson Valley, and look forward to continuing to work with the City of Beacon on this event." The Cupcake Festival was set up on Beacon's East End of town, which went against Beacon festival tradition. Usually, events are held on the West End, starting at Bank Square and ending somewhere in the middle, usually around the Yankee Clipper diner. In the case of the Halloween Parade, processions usually end at Echo, with families extending the parade themselves, around the corner past Beacon Falls Cafe to find more candy on the other side of that sharp turn in the road. Around the bend are shops, galleries and restaurants that many visitors have yet to stumble upon: Utensil, Waddle n Swaddle, Sukhothai Restaurant, BAU, Russell Cusick's gallery, Raddish, The Green Room, Abscission Barber Shop, and so many more. But do most people even know these storefronts exist, let alone frequent the businesses? Plus, did the storefronts want this kind of shutdown on Main Street in front of their stores? Sometimes businesses complain when festivals close Main Street. Anne Perrone St. George, owner of The Chocolate Studio, has wanted events on the East End for years. "There have been no opportunities from events for us on the East End. Even the Spirit of Beacon Day Parade, which is held on the West End, doesn't allow for businesses to set up vendor tables. Only nonprofits can set up tables. That doesn't help us, and keeps the people [visiting] on that end of town for the day, leaving this end very dead. They do the Pumpkin Festival, the Corn and Strawberry Festivals, and beer events at Riverfront Park, and no one gets to the East End of Main Street and supports local businesses," she says. Cupcakes: Not an Everyone Thing? Days before the event, a man approached me to ask: "What is the deal with cupcakes? Are they a big deal?" Others who are either not fans of crowds, or not fans of cupcakes, also weighed in. Says Beacon resident Justin Riccobono: "I walked through the event and found it somewhat unappealing to me and very crowded. I'm not really that big a fan of cupcakes, but that's OK. It looked like many people enjoyed themselves." The Curated Gift Shop, located in the new retail spaces at 1 East Main (down a little hill from Main Street), summed it up in this Instagram caption for the photo below: "I stamped this cuff [bracelet] before the @king_and_curated store was even open. Then I heard we were having the cupcake festival in Beacon this year. Goes to show you, if you build it... they will come." Photo Credit: Posted at @thecuratedgiftshop, taken by @mrcvaughan. Is The East End Of Beacon A Big Deal? Yes. Over the 2016 holiday season, I received an email from a shop owner titled "The East End Is In Trouble." The email's author proceeded to ask for my advice, while sharing who they planned to connect with in hopes of increasing the number of people who actually walk down through the East End. So many businesses on that strip are concerned. They have formed a coalition, called the Beacon East End Business Association, to connect and brainstorm ways to bring people down that way. After the abrupt closure of The Hop, foot traffic on the East End plummeted, which hurt several storefronts located on that end of town, according to several business owners. Local artist Russell Cusick has been documenting what the East End looks like on different days. Although imagery of a rainy, quiet end of town is beautiful, it's hard on a business owner who is trying to bring exposure to their store. Pictured below are contrasting photos Russell has taken lately - both on rainy days (it also drizzled off and on, with a chill in the air, during the Cupcake Festival). Photo Credit: Each photo was taken by artist Russell Cusick. The artist Russell Cusick outside of his East End gallery, making one of his signature Beacon manhole covers. Russell has been vocal about his support of increasing exposure to the East End of Main Street. He is a member of the Beacon East End Business Association. "Being on the East End of Main Street, a lot of people don’t even know that we’re here. So just to get those numbers of people on the street here is important. I feel that the East End is really a special part of Main Street, and a special part of Beacon. Once people experience this part of Beacon, they will be back. So I think that’s good for local businesses on the East End." Parking, Trains, Walking - What Was It Like? As with any large event happening in one's own town, there were some Grumpy Cats expressing doubts about the event, concerns over parking, and the big question: Would it be good for business? 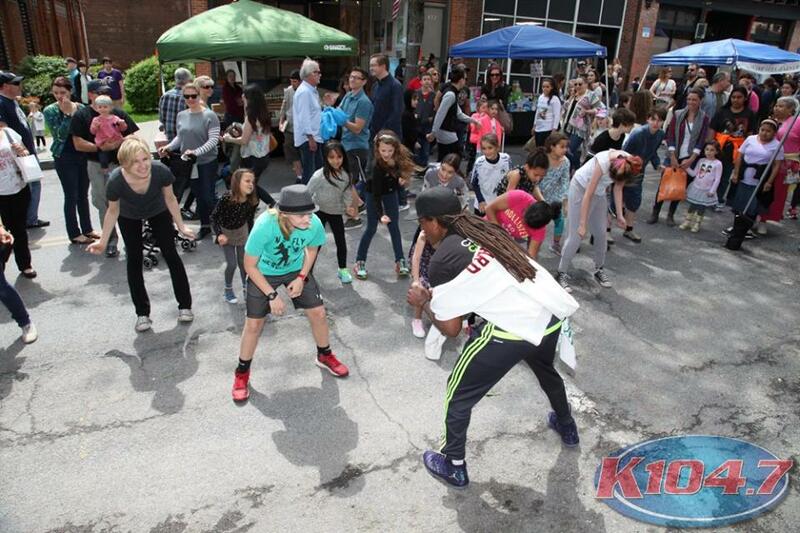 At the end of the day, 10,000 people came to Beacon by train, foot, and car, according to Sam from K104.7. Somehow the parking was absorbed. 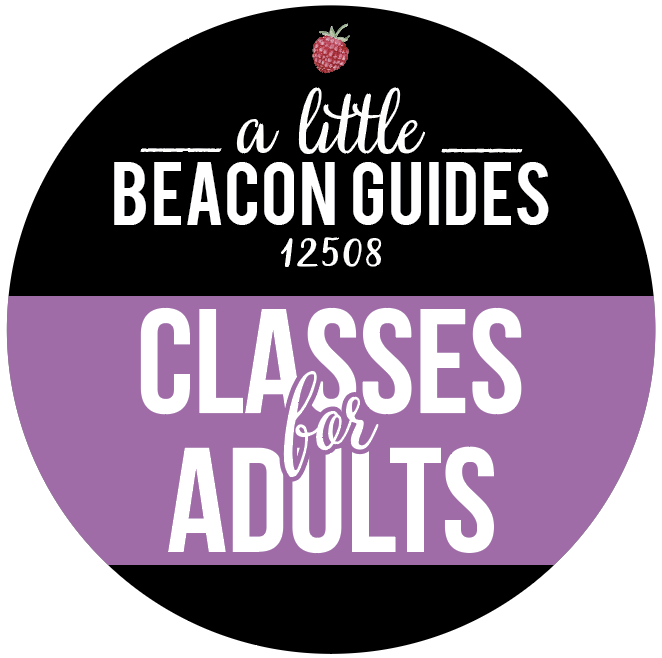 A lot of people hit A Little Beacon Blog's Free Parking Guide page before coming, and even wrote into us asking for walking directions. Recalls Sam after the big day: "I spoke with people from as far as Brooklyn and New Jersey to Monticello, Pennsylvania and Connecticut!" Liz Ferrera, owner of reMADE on the West End of town near Bank Square, reported that a large SUV parked in front of her store for longer than the allowed two hours, leaving her forlorn when the carload of people did not pop into her shop to take a look around before driving away. The two-hour parking rule is known to be - for the most part - unenforced in Beacon, and is a common complaint among business owners. Fellow business owners sometimes park in front of shops for hours on end, as do residential tenants who live above the storefronts and park all day and night. We discovered this trend during our survey of businesses on Main Street when the topic of parking meters bubbled up. Most wanted enforcement of the two-hour parking rule to happen first, before investing in and installing parking meters. Main Street isn't alone in its parking woes. It's a part of life on residential side streets like where I live. Surrounded by three churches, every Sunday, cars fill the street to go to church. Cars don't block us in, but backing out of the driveway is hard, and if we're expecting company, we put out our orange cones to reserve parking. Back where I come from in Ohio, when a spring festival comes to town or Fourth of July parades are hosted, parking gets very creative, strategic, and for locals, often involves parking in friends' driveways as favors. Some owners of private parking lots charge for spaces for the weekend, making extra cash during the festival. Hopeful visitors wrote into A Little Beacon Blog for directions on walking from the train station to the festival. Key Food set up their Kettle Korn tent to catch the walkers headed to the festival with the irresistible smell of popcorn, and reported that the stand "did very well." Businesses from sewing store Beetle and Fred to Alps Chocolate to Mr. V's all reported watching crowds of people whooshing down Main Street, hoofing it on foot to get to the cupcakes as quickly as they could. Says the Alps manager, "I don't know what the rush was. There were plenty of cupcakes, right?" How Many Cupcakes Sell At A Cupcake Festival? Well... of the 70 vendors that participated in the festival, 18 of them were cupcake makers. K104.7 recommended that vendors bring at least 1,000 cupcakes, and to price them no less than $3, most likely as a way to create pricing fairness. As a cupcake festival vendor newbie, this recommendation was a bit unbelievable. After experiencing the festival, however, and the lines that did not quit, it was clear that cupcake lovers were there to get lots of what they wanted. Joe Condon, owner of Joe's Irish Pub, observed: "The woman who set up in front of my pub [must have] made a killing. She was sold out by 3:30 pm." The festival started at 1 pm and ended at 5 pm. Jason Schuler, founder of Drink More Good, has made participating in markets all over the state his number one marketing strategy. He can do about eight markets a weekend with this team. Drink More Good's main storefront/kitchen is located closer to the middle of Main Street, not in the heart of the festival with all of the foot traffic, so how did they fare? "The Cupcake Festival was a huge success in my opinion. It brought an insane amount of people to Beacon, and I guarantee a good portion of those people will be back to explore the town at a later date. We saw an increase in new traffic that day, but also had a private event in the evening that we closed early for. The only thing I'll do different next year for the Cupcake Festival is to actually get a booth at the event and sell as a vendor!" Was the Cupcake Festival a Milestone Day for Everyone? Meanwhile, Kim's neighbor, Brenda Haight Murnane of Beacon Bath and Bubble, had been one of first vocal skeptics of the festival. After the big day, she declared: "I'll eat my words now!" Brenda saw sales like she gets the day before Christmas. Which is a pretty big deal on a random day in May - that was rainy. "People were pleasant and happy to be in Beacon, many here for the first time. The foot traffic in here was awesome. I was freaking out because my daughter couldn’t be in to help me that day. My husband stood in." Diva, the Woodman's sidekick on K104.7's morning show and pictured below, couldn't help but enjoy the day, and had time to appreciate the setting while surrounded by a backdrop of trees and mid-renovation old factory buildings. "I'm so glad this event was in Beacon! Beacon gets no love, and it is so nice here!" Diva, of K104.7 in the morning. Harry's Hot Sandwiches up the street also declared a great day: "Things were great for us. Without the festival I think it would have been a quiet day because of the cold and rainy weather." Others outside of his store observed that people walked into his eatery, looked around, walked back out to check out their sandwich options, and came back in to order up. Further up the road at The Vault, owner Anthony DiSarro checked in the black: "The impact of the festival on business at The Vault was positive. We saw more families than usual, with parents eating and drinking, but children mostly 'cupcaked out.'" Later that night, The Vault would host an '80s and '90s Dance Party, so it was a full day of music for them. The vegetarian-friendly eatery, Raddish, which normally has quiet business as it's located in the blind spot of the turn, happily reported a very busy day. During the Cupcake Festival, Anne of The Chocolate Studio put a table out on the sidewalk in front of her store to draw attention: " After a very long winter, I was happy to have a very good sales day during the Cupcake Festival. I was happy to have the Cupcake Festival on Main Street," she said. Emily Burke, supplier of all your kitchen needs at Utensil, had a table outside on the sidewalk in front of her store, selling cupcake-making things. Her daughters had baked cupcakes the night before, and were handing them out. "My sales were just about the same as an average Saturday. That said, I do think many people 'discovered' the East End shops, though it's difficult to quantify if that actually turns into new customers. From a non-retailer perspective, the event was well-run, and people were respectful and having a good time." PS: Pictured below are some tools to make cupcake-baking easy. Find them at Utensil: Sturdy paper cupcake holders that let you skip using a muffin tin! Just pop them on a baking sheet - standing alone - and then bake (I tried it). Finish up with icing-art by getting piping bags with different shaped tips for squiggle designs, dual colors, and more (these are like paint brushes for a baker). Staphanie Carapola Jones, owner of The Blushery and a lifelong Beacon resident, chimed in from the services side of business. Stephanie runs a brow bar, offers laser hair removal, is a makeup artist, and sells the makeup in her store. "Everybody had to pass The Blushery to get to the festival, which started a few stores away from us, so it was great. I set up a table right outside my shop on the sidewalk and had a lot of people stop in to take my service menus [and] samples. I think the people had a destination in mind and it was for the cupcakes and a street fair, not necessarily shopping boutiques. But they got to see our little business district and will possibly make a future trip here to actually walk around and check out all the stores." A fire-torched s'more cupcake from The Roundhouse. Photo Credit: Stephanie Carapola Jones, owner of The Blushery. Did the festival inconvenience Stephanie's customers? 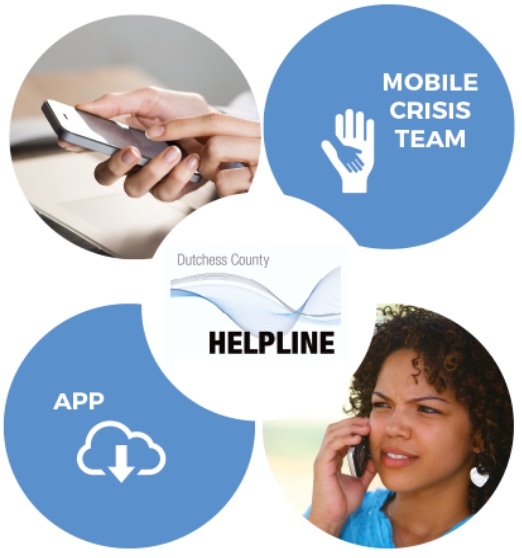 "I made sure to inform my customers about the event and logistics before they came in for appointments. They got there fine. Nobody complained to me when coming in the shop." What about the new strip of retail shops at 1 East Main? We asked one of the latest newcomers, The Curated Gift Shop. Did people come down the hill from Main Street? "No," says The Curated Gift Shop, "but I was stuffing my face with cupcakes, so it was probably for the best." A Little Beacon Blog's vendor table was located across from 1 East Main and across from the Roundhouse's vendor table showing off their cupcake skills (see The Blushery's photo above for a sample). We offered face-painting, whose proceeds would go to the Kindergarten Teams of Beacon's Elementary Schools. Normally we hold these events in our storefront office at 291 Main Street, and we're lucky if we raise $15 on the day because face-paints are only $1 and it can be tough to attract people inside. During this festival, we had a solid line that we had never experienced before, and I was the only face-painter. Normally, my kids and their friends enjoy helping, but it became very clear very quickly that this was the big leagues and parents new to our business model didn't know what to make of the little painters. When I had to go judge the cupcakes, I needed to leave the table, and did not warn the line or have an official backup painter (Eeeks! Sorry everyone!). My friend jumped in reluctantly and ended up enjoying it once she got into the rhythm, but we are already planning ahead with new systems for next year! We raised $70 that day, which we are matching to send $140 to Glenham Elementary. Thank you everyone! Most Importantly, Who Won The Cupcake Contest? The Bourbon Bacon Cupcake! Baked and presented by Daniela Haugland. She won the $1,000 courtesy of the Poughkeepsie Galleria. Daniela Haugland won first prize for her Bourbon Bacon Cupcake. She won the $1,000 courtesy of the Poughkeepsie Galleria. The winning cupcake, Bourbon Bacon Cupcake, baked and presented by Daniela Haugland. Second Place went to Dara Lippert with her Coconut Dream Cupcake. The People's Choice Award went to Melissa Torres for her complex Bailey's Brownie Cheesecake Cupcake. The People's Choice Award went to Melissa Torres for her complex Bailey's Brownie Cheesecake Cupcake. The Poppy's sign has come down, but the space at 184 Main Street known for farm-to-table burgers will open soon under new ownership. fear not: Beacon will keep its burger joint! Days after the ink dried on the closing papers for the one-story building that until last week was home to Poppy's Burgers and Fries and owned by its founder Paul Yeaple, a press release went out announcing that the building's new owner - Brian Arnoff, owner and chef at Kitchen Sink just across and down the street - would be opening a second restaurant on Main Street. Meyer’s Olde Dutch, "a casual, modern interpretation of the classic burger joint," is slated to open in May 2017 in the 184 Main Street location. Making use of the bar that Poppy's had installed during its last round of renovations, Meyer's Olde Dutch will run a full-service bar, serving a large selection of New York craft beer, locally produced wine, and house-crafted cocktails. Kitchen Sink is known for its selection of New York-made wine. They are also known for locally sourced beef, cheese, and local produce, which will make its way into the new burger joint. Kitchen Sink, followed by Meyer's Olde Dutch, has taken farm-to-table to a new level: The Arnoff family owns a micro farm, Truckload Farm and Orchard in Hyde Park, which supplies some of the ingredients to Kitchen Sink. In addition to classic beef patties, Meyer's Olde Dutch will offer lamb, chicken and vegan options with plenty of toppings and house-made signature sauces, plus hand-cut fries, sweet potato fritters and salads. The burger joint that had planted a flag at this location wasn't just any burger joint. Poppy's owner, Beacon native Paul Yeaple, was a Beacon pioneer of the farm-to-table ethos. When speaking to Southwest Dutchess, Paul reflected: "When I started Poppy's eight years ago, there was no local food anywhere in Beacon. Now it's abundant. Maybe we can go to another town and help incubate a better food situation for them too." Paul certainly has left his mark for farm-to-table, as Meyer's Olde Dutch will be dressing the burgers with produce from their very own farms. That kind of farm-to-table match is rare. For more on Paul's thinking about why he closed Poppy's, see Brian PJ Cronin's article in the Highlands Current. Meyer's Olde Dutch is named after Brian's great-grandfather Meyer, who once owned and operated Olde Dutch Grocery, across the river in Middletown, NY. With the new place, Brian says, “We look forward to bringing the same passion for food that we’ve provided across the street in our fine dining establishment, but in a more casual atmosphere.” The atmosphere at Kitchen Sink is already quite casual - a classy casual - with a seriously impressive menu that changes with the seasons and with what's been harvested, presented in a way that is a work of art. We can't wait to see what casual looks like at Meyer's Olde Dutch. Arnoff's goal is to be open by Saturday, April 29, 2017, the day Beacon Barks parades down the street on the West End of town. Take-out is slated to be available from a side-door location down the alley between buildings. If you're excited about the side-door take-out as a new perk of the burger joint experience, just wait to hear what else Brian has in store. Anyone who has had the grilled cheese or mac and cheese from Kitchen Sink knows that there is something spectacular about those oozy, creamy dishes. After years of culinary training and apprenticing, including a stint in Italy where he "developed a deeper appreciation for seasonal ingredients and regional cooking," Brian opened a mac and cheese food truck. CapMac was one of the first food trucks on the DC mobile dining scene. Brian sold the truck three years later, before moving back to the Hudson Valley to literally and figuratively put down roots. Pictured: Brian Arnoff, owner of Kitchen Sink, the new Meyer's Olde Dutch, and of the 184 Main Street building. This photo was taken in March 2012, back when the Vintage Cafe was serving breakfast and lunch amidst their antique collection. Sunshine gets anyone giddy, but when it beams on a weekend in Beacon, the first weekend in Beacon after a snowstorm hit the previous week, that results in a lot of people out on the sidewalks, exploring. 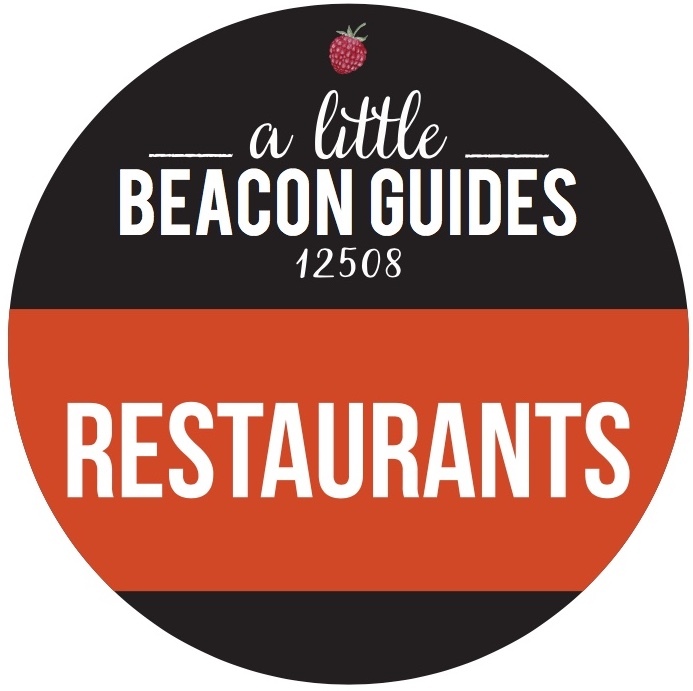 It inspired me to head out and hit winter clearance sales at Mountain Tops and Bellus on Main, but if you were out and trying to get lunch or dinner at your favorite restaurants, chances are you were met with a 25-minute or even an hour wait, as certainly was the case at Beacon Falls Cafe. Once in, the special may not have been available anymore! "We were packed for all three days, even Monday," recalls Stefany Lynn, bar manager at Max's on Main. "There was a steady stream of people for the entire day. The dining room was full at 10:30 pm. We ran out of sloppy joes! I couldn't even get one!" Max's wasn't the only restaurant that ran out of dishes. The Vault ran out of their salmon special when they opened the patio sooner than anticipated. Says Vault manager Chris Sudol about the weekend: "For the most part, the weekend was a big success, and we definitely learned a few things as well. Opening the patio was great for the public, and we did business that we haven't ever seen at The Vault before. The only time we saw sales like that was when there was a band playing, and the sales came from drinks." Jason Schuler, owner and partner at Drink More Good, expressed with eyes wide open: "Did you see how many people were out this weekend? We did summer numbers!" Summer numbers is a sales term that refers to a great sales day, usually expected and hoped for in the summer, not for a weekend when people are usually trying to squeeze in a last ski run. Other weekends that tend to be great are the weekend after Thanksgiving, and other weekends during December. Restaurants in Beacon usually go on vacation during the first weeks of January in order to give staff a break and recover from the intense holiday season. Welcome to early spring, Beacon! And welcome new visitors. 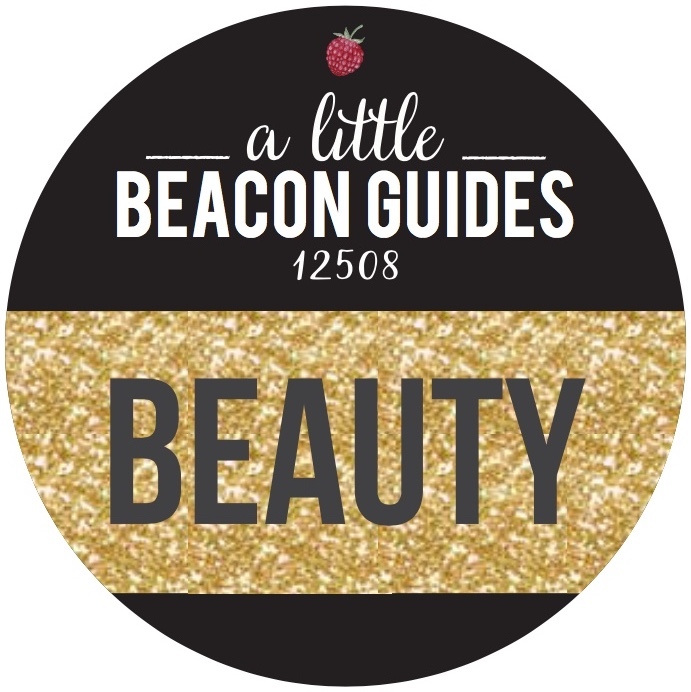 Be sure to check A Little Beacon Blog's Things To Do In Beacon Guides for your full list of things to do, shop and eat during your stay!